This soup is so unbelievably thick and creamy, you'll be surprised to find out there's nothing "creamy" or fattening about it. The secret to the texture is rice (that's pureed rice, to be exact)! Onions are sauteed in olive oil, to which chopped asparagus, basmati rice (or jasmine, I used basmati), a veggie bouillon cube, and fresh thyme are added. Simmer everything for about half an hour, or until the rice is soft, then put it all in a blender and whirl away until smooth. 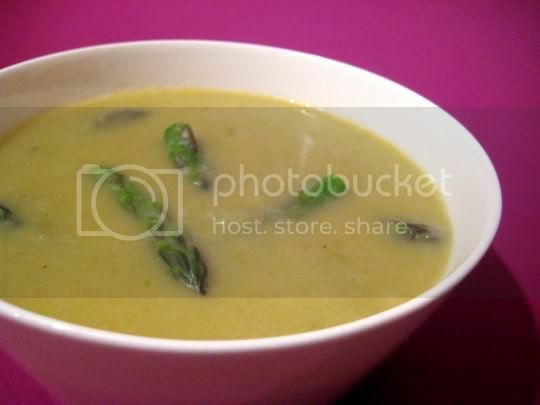 Fresh asparagus tips are added at the end, and provide some nice crunch and color to the soup. It's mild in taste, and strangely does not have a heavy asparagus flavor. What you do taste is the richness of the rice and a faint saltiness from the bouillon. The pureed rice also makes the soup rather hearty and filling, and the starch is sure to provide you with a filling meal. Make again? Yes. I'll have to try broccoli next time as a different twist.